I hope you’ll join me live tonight at our new summer hour of 9pm ET / 6pm PT for the party and an interactive Tips Tuesday recap and breaking news discussion on the BlogAid Facebook Page. You can also catch the quick recap later that evening on the BlogAid YouTube Channel. Wow, July 3rd, y’all. Second half of the year starts now!! How you are doing with your site success plans? We weren’t able to close on the house last week. The title company misspelled the seller’s name and she has to fly back from Germany in 2 weeks to sign new papers. Since it’s an estate sale, there is no other way but for her to do it in person, in ink. She’s in the military, and that’s as soon as she can return to do it. Needless to say, that has thrown a huge monkey wrench into my plans for July. So, I’m making a new plan, most of which still centers around SEO and improving BlogAid’s reach and helpfulness. One of my goals at the start of the year was to redesign the main BlogAid theme this summer. I started with boosting the speed while I had my head all up in the speed tests for the first 3 months of the year. I’ve been tweaking on this theme for 4 years and it’s time to make a total switch to a newer base. All of those things are SEO factors now too. Plus, the focus of my biz has changed a lot over the past 2 years as well and I need a content and layout revamp that makes it clear what my offers are and who I serve. Plus, I have a ton of valuable content, but I don’t necessarily make it easy for folks to find, or find again. So, I’m doing something about that too. And this is me putting my money where my advice is. Yes, Gutenberg will be rolling into the core later this summer. But I can’t see us having viable themes and plugins that are fully compliant until closer to 2020. And I need to do what I need to do for my biz now!! My new theme design will be radically simplified. That’s going to give me all the speed, SEO, and other compliance benefits I mentioned previously, but it’s also going to cut costs on the design too. Plus, when it is time to switch to a Gutenberg theme, I will have a far less complex site, and that’s going to cut costs then too. Along with a new structure for helping more folks find content on my site, I’ve also started new promotion tactics for that content. And I am delighted with the help that Sheri Prest-Herman of Colorist Cafe has been giving me with that!!!!!!! All those fun graphics you’re seeing on Facebook and Twitter that highlight the valuable info in Tips Tuesday are being made and posted by Sheri. She started as my site audit client and now I’m her VA services client!! And, it’s working!! More folks are visiting and re-visiting Tips Tuesday and getting so much more good out of it. I know y’all read and listen to these posts, but sometimes you need a reminder to go back and check out a post I mentioned, or a tutorial, or such. So, thank you so much Sheri, from all of us!!! 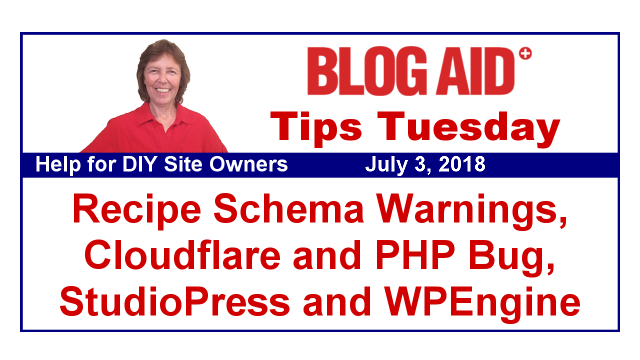 And, Sheri will be right in the middle of this big content revamp task for BlogAid too, and will help more DIY site owners find the site success help they need. Y’all may recall that I started the DIY SEO workshops 2 months early this year. We began in January to give folks extra time to get their technical SEO ducks in a row. And to start planning for content changes so they could get more posts into Google’s featured snippets and Voice Search. I had planned to run a series of quick challenges through the rest of summer to help folks see where they are with their plans and get back on track. I’m still planning on doing those, as I need them too, especially with the content and theme revamp I’m doing. I’ll just have to be more flexible with the schedule and do some flash challenges. So, if you’re in the course, look for announcements in our Facebook group and emails soon. And this is a great time for you to jump into the course too!! Yoast just made some big changes to his SEO plugin and I’ve got updated tutorials underway. That will be a fine time to check all of your settings. Plus, new Google Analytics and Search Console courses are coming this fall or winter. Since the house closing got postponed, I’ve been at my desk every day working on site audits and HTTPS conversion requests. Several of the current clients required moving to a better host first, and then doing a ton of cleanup on sites they have had for 5-10 years where they tried every plugin on the planet and had even jumped to different hosts. Those things left a LOT of garbage behind, so the cleanup took a while. But, wow, are those sites a lot faster already!!!!! And, they have far less glitchy stuff happening now that all those conflicting directives and orphaned files are out of there. We’re moving straight into HTTPS conversions this week. I think I have one scheduled for nearly each day of the week. If you’re on the waiting list, just know that we’re going as fast as we can and I’ll be contacting you soon to onboard your project as I complete each one that is on my plate. And I’m heartbroken for one of my site audit clients. At the time, she had just renewed with Bluehost and didn’t want to leave despite my warnings that they don’t allow all security measures. And sure ‘nough, she got hacked. Now she is having to pay to get that fixed, and will still need to move to a new host. And all of this under duress instead of being able to budget the time and money for it. You can get the whole story from this livestream on the BlogAid Facebook page, about how cheap, and junk hosting can cost you a fortune. That’s also where I do my BlogAid Today tips and breaking news streams live too. So be sure you Like, Follow, and turn on notifications so you always see the info you need as it happens. FYI, since the end of 2017 I’ve washed my hands of doing any site work on any EIG owned host, including Bluehost, HostGator, A Small Orange, and 50+ others. Besides not allowing full security measures, I can no longer even see all the stuff I need for a full site audit. Plus, they don’t terminate the SSL certificate properly. And that’s why they don’t offer Let’s Encrypt SSL certificates either. I’m also hands off with GoDaddy hosting, as well as InMotion Hosting for the same reasons. So, if you’re on one of those hosts and want to work with me, I will encourage you to move to a better host first where we can actually secure your site and make it fast. Most of my webmasters have sworn off working with these hosts too, and for the same reasons. If you’re a designer or site maintenance person, or a blogging trainer, and still recommending these junk hosts, then you’re doing a huge disservice to your clients too. In fact, I’m working with one such person right now, who made the switch to SiteGround from Bluehost just prior to coming to me for an audit. From what she learned in that audit about how BH does, she’ll never recommend them to her clients again!!! If you haven’t received an email from Google Search Console yet about schema markup issues with your recipe plugin, you soon will!!! See my post for what’s going on and how to check your plugin, plus what you should do about it. I want to thank my site audit clients for bringing this to my attention in our Facebook group and for sending over their emails and reports. And I want to send a huge thank you to Marilyn Lesniak of Marilyn’s Treats for her invaluable help and expertise with getting to the bottom of this issue. Marilyn and I are already working on recipe plugin review posts, including the schema markup they output. But, we are going to delay that for a bit, while these plugin devs do their fixes. I’ll keep you posted on it. Also with this issue, plenty of the recipe plugins devs are seeing this reported on their support forums. He’s saying that they are in the process of updating the plugin to fix this issue. Although he did not go into detail, I would imagine the fix will be to not output empty schema markup fields for things you are not using, so Google will no longer flag them. And, I’m betting that many other recipe plugin devs will follow suit. In fact, the plugin devs are getting swamped with support tickets on this and we’ve heard from several of them that they are fixing things on their end, as best as they can. So, some of this may resolve itself with your next plugin update. Be sure to look for mention of things like that when you view the changelog on plugins prior to updating them. You do read those plugin changelog notes, right? Definitely something you want to get in the habit of doing now, especially with Gutenberg looming around the corner. The new Yoast SEO 7.7 version has lots of changes to the Snippet Editor. I’ll be updating the Yoast tutorials in my DIY SEO course with new screenshots over the next week. I want to give them time to work out any bugs and get user feedback on wording and use first. Makes me feel a lot more confident about the GDPR choice I made for BlogAid, which is similar. And I’m starting to see this everywhere. My first reaction to this was NOOOOOOOOO! I’ve never understood StudioPress’ focus on hosting. And those packages never made any sense to have. I see this move to be swallowed up by WPEngine as a continuation of that hosting focus. I’ve heard a couple of interviews with Jason, the owner of WPEngine and met him at WP Meetups in Nashville. He has drunk a LOT of Matt Mullenweg kool aid. They are deep in Matt’s vision for WP. And they are deeply involved in the community. But honestly, I was not at all impressed with their vision in the announcement they made about this buyout. Basically, they are tickled to be able to offer Genesis and StudioPress themes to their hosting clients. I’m betting they are also tickled to obliterate Synthesis, which was StudioPress’ hosting venture, and a direct competitor to WPEngine. I was glad to read in Brian Garner’s post that Nathan will remain lead dev for Genesis and that the whole team will move over to WPEngine. But honestly, it is all of the community designers that are keeping StudioPress themes viable. Nathan had to do two huge updates to bring Genesis into alignment with WP core and the documentation on those were poor, at best. Quality control and/or standards for theme design are nonexistent. I’m extremely concerned about how all of this could fall apart with this move, and with Gutenberg changes looming, and Genesis lose the one thing that made them great, which was a clean coded framework and child themes that designers could count on to be clean too. You can see my BlogAid Today livestream on this for more details. I want to thank my site audit clients Rachel and Gaye for bringing up this topic in our Facebook group. I tell you, that group is one huge perk for getting site help from other site owners in the know. They’ve all been through the site audit education and fixes and they are empowered and knowledgeable DIY site owners. All the answers to questions in that group don’t come from me. They come from each other. What a super, rich village we have!!!!!! Back to the point, Rachel discovered that the Shared Count plugin does not show the image when sharing to Pinterest. You may recall that I mentioned that recently revamped plugin as an alternative to Social Warfare a few Tips Tuesday’s ago. The image does get pinned to Pinterest, it just shows a blank in the preview. And that causes the sharer to abandon the attempt. This is easily fixed by turning off Hotlink Protection in Cloudflare. It’s under the Scrape Shield settings. Now, I hate that has to be turned off, as it protects your site’s images from being scraped by bots. This same issue will happen if you have any other type of hotlink protection or code on your site too. I posted about it in the plugin’s support forum, and they are telling me to contact Cloudflare about it. So there you go. A new bug popped up when you’re on PHP 7.2 at your host and using Cloudflare. It’s not happening for everyone, and I’m still trying to get to the bottom of why that is. But, if you do encounter it, you’ll see the error on a white screen when you attempt to save a post or delete a spam comment. It flags the hooks.php file in the Cloudflare plugin. The fix is to downgrade the PHP level at your host to 7.1 for now. You can see my blog post above for more details, plus my livestream on it. READ: How and Why to Switch to PHP 7 for more details on that. We’re going to run into more bugs and conflicts with this for at least another year, while more plugins get updated to some version of PHP 7.x and start dropping support for older versions. That’s another reason you need to make the jump to at least PHP 7.0 because you could update a plugin that has dropped support for older versions and cause all kinds of havoc on your site, including not being able to access it, depending on the plugin’s function. This is also why you need to ensure you read every Tips Tuesday post. The tech of DIY site ownership is changing every day. My job is to help you avoid the headaches, and make good, calm decisions about your site, and empower you to easily do them yourself. I couldn’t have jumped on this recipe plugin news without you and our group, Marilyn!!! Thank you for being on top of it too!! Good info and timely as always. I use Genesis for my website clients, trying to provide the very best site that I could for them. I stayed calm when I read the announcement about WPEngine, waiting to see your take on the situation. Thank you for all that you do, MaAnna! I’m sticking with Genesis for the revamp. And hope to stick with them after Gutenberg. I’m sure they have a plan because if they don’t, they’re gone. The community won’t let that happen, but will be a BIG switch for everyone. That’s why we’re focusing on Gutenberg in our Webmaster Level 6 meetings later this summer. Designers HAVE to stay well ahead of the curve! Great post! I love the facebook group as much as I love Tips Tuesday-I learn so much from both! I’m really enjoying our group too, Tipper!!! And I learn a lot from everyone as well. Thanks, Erin. Hopefully we’ll get back on track soon. Gotta just roll with it sometimes, right?